In 1993 EA published there first soccer game for the Sega Genesis. 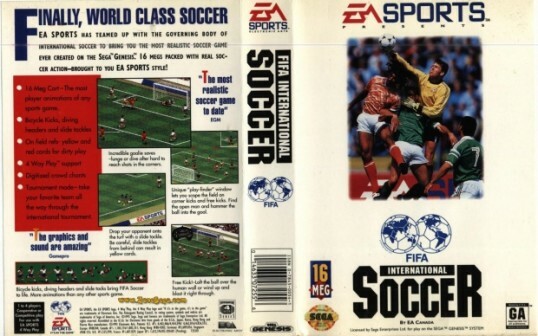 Since I'm fortunate to have both the Genesis and FIFA International Soccer I took it for a spin. Not a terrible first effort, considering there were not too many soccer games around at the time. It plays out as more of a kickball game. Controls are very simple and pesky rules such as fouls and offsides can be turned off. It's up and down. Goals can be scored from anywhere on the pitch (practically). It is meant to be played with four people, and in that, succeeds. That said, it does have some game play elements that are taken for granted today. For example: Formation selection, Replay, Tournament Mode, and Substitutions. It has crowd chants and goal reactions. Lots of things that make soccer unique. It is a very well done first effort. The music is Starscream (The Future, and it Doesn't Work) and the magic happens in the video where the hula girl dances. 2606 is still in here... some, where. So where does it fall on my ranking scale? Overall, pretty low. But, ranked higher then many sports titles on current generation of consoles. The average off all my rated sports games (I rank them low) is 34. So it is right in the middle.